Is this 2.75 or 2.5 depth? Based on your observations in this video, is Townshend's 6120 2.75 or 2.5. I'm really not sure. Hard to gauge a 1/4" difference from a dark, grainy video. We don't need to see or measure it... that's Pete's 1960 Chet Atkins 6120... they were made with with 2.5" deep bodies. With respect to Townshend's 6120, could it not be a very early 1960 model that still had the 2.75 depth? kc_eddie_b literally wrote the book on the 6120; if he says it's a '60 you can bet it's a '60. If questions about 6120's and Gretsches in general intrigue you, this is an excellent book. "These new Bigsby vibratos first appeared on 6120 examples in the #330xx batch. Guitars from this group are quite unique as they represent the only batch of 6120 archtops with the combination of a V-style Bigsby and a 2.75" body depth" (p.112). 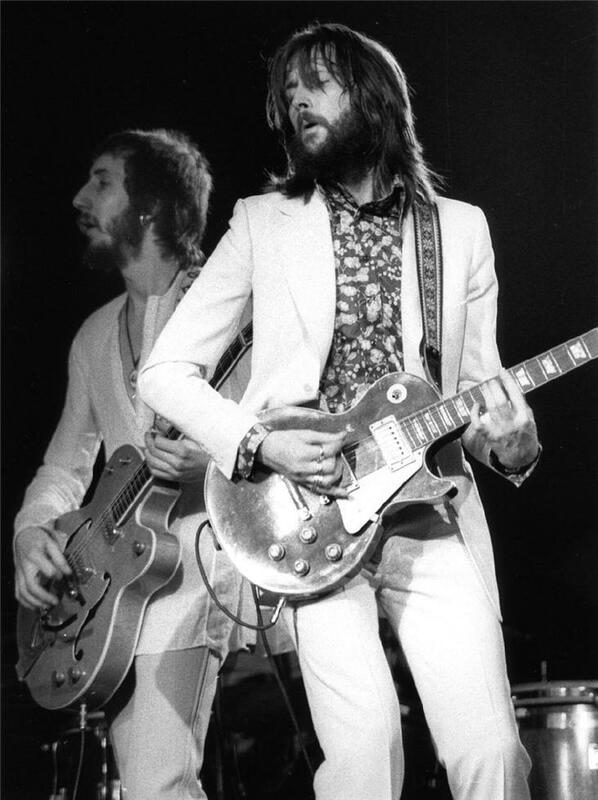 I know Townshend's Gretsch is a 1960 model. My question remains, is its depth 2.75 or 2.5? I'm invested in finding out the answer as I am having the Gretsch Custom Shop build me one and I want to make sure about the depth specification. That's a very cool project. It seems that it's 2.5" and if there were any variants, Ed would have noted them. But wait for him to chime in; nothing is written in stone when it comes to Gretsches and transitional features abound. Just going by the percentages... there were precious few deep bodied 6120 with V-style Bigsby units, so when any 6120 with a V-style Bigsby surfaces (that isn’t a ‘61 example) odds are the body is 2.5” deep as the overwhelming majority were. Having said that, anything is possible. I’ll shoot Alan Rogan a note and ask for verification. "The Gretsch 6120 that I used to write and record "Stretch Out And Wait". You can hear it on "Is It Really So Strange?" too. I got it from The Who and It's one of the best old 1960's Gretsch's that I've played. I got introduced to a guy called Alan Rogan who used to work for Townshend, Clapton and Keith Richards. I ended up getting a load of guitars off him. That's where the Gretsch 6120 came in. It's the one Townshend played on loads of Who stuff. I don't know why he sold it to a geek like me." Johnny used this 6120 on 5 out of 6 documented dates of the Smith's final 1986 tour, for Meat Is Murder only. It was tuned to Open G, the same tuning used on "Stretch Out And Wait" and "The Headmaster Ritual". Wow. Johnny Marr owns that 6120. As far as the V cut and the body thickness goes I’ll share what I’ve seen. The 33000 batch is the transitional batch. I own 33002 and it came with a V cut and is 2.75”. Setzers original 6120 is 33024 and is 2.75”. Ed and I visited # 33025. It’s 2.5”. We were expecting it to be 2.75”. Nope. The earliest V Cut bigsby (I’ve seen) with a Gretsch by bigsby pat applied for stamp on it was on a 6120 with a 29000 serial number. The 6120s from 33100 and on are certainly all 2.5”. They may be marketed as 59s as they so often are incorrectly done. All of these 6120s with a 33xxx are 60s with a few leftovers from 59’ that are from the 33000-33024. I believe Brian’s to be one of the last, if not THE last of the 2.75” deep 6120s. Thank you everyone for all this information ... much appreciated. I'll await further investigation from others to see whether the depth is 2.75 vs 2.5. I'm no expert but to me upon visual inspection (video, pic) it looks 2.75. Yes, Setzer's #33024 is 2.75" and #33025 is 2.5" but I know for a fact that #33064 is 2.75"...100% sure...so #33024 definitely wasn't the last with the 2.75" body depth...there are later numbers in that batch that also have it...by the way, #33064 does have the 2.75" body depth but also a neck made for a 2.5" body depth, the neck heel is not deep enough for the 2.75" body...so a true transition guitar. I placed my order with the custom shop ... 2.5 it is!